Former Buddhist monk-turned-filmmaker, Greg Sneddon will present his powerful debut feature film, “Arrows of the Thunder Dragon” at special event screenings in cinemas around Australia from April 29 through to May 7. Each screening will be followed by a Q&A session with the Melbourne-based director, who also wrote the screenplay and composed the score. He will be joined by the film’s lead female actor, Tshering Zangmo (aka “Ketii”) who is travelling to Australia from her home in a faraway village in Bhutan. Set in the 1980s, the story of “Arrows of the Thunder Dragon” follows brother and sister Kuenphen and Jamyang, where in a remote Bhutanese village, they learn traditional archery (the national sport of Bhutan) from their old warrior grandfather. Their mother’s sudden illness gives Kuenphen the opportunity to explore the world outside the village, while sister Jamyang must stay home to weave, cook and prepare for marriage. Filmed entirely on location in the magnificent Himalaya mountains, the actors are made up of local highland village people. The ‘ordinary’ current traditional medieval life in tiny isolated Bhutan is fascinating and anything but ordinary from a modern western point of view. Arrows of the Thunder Dragon pays homage to the Bhutanese Olympic Archery Team, and was inspired by the lives of local Olympic women’s archery heroes, Sherab Zam and Tshering Chhoden. A percentage of ticket sales to this event will be donated to the Buddhist nuns in Bhutan, who provide shelter for women affected by all forms of violence. 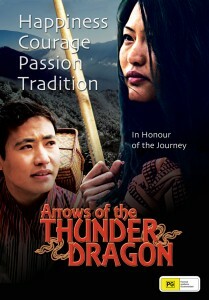 * “Arrows of the Thunder Dragon” had its World Premiere at CinefestOz Film Festival in 2014. Sneddon has since re-edited the film, and the director’s cut will be premiering at these event screenings. “Ketii” arrives in Australia on April 22, the date chosen by her local village astrologer, who also governed the shooting dates for “Arrows of the Thunder Dragon”. In Sydney, Greg and Ketii will be joined by cinematographer Leki Dorji, who worked as the official Royal photographer in Bhutan. Greg Sneddon intends to return to Bhutan and conduct master classes for local budding filmmakers.